Environmental hazards are substances found within a confined environment which can pose an exposure hazard if ingested, inhaled or absorbed. These include such agents as dust, mold and fungi, carbon monoxide, pyrolysis emissions, nuclear waste and many others. The wide range of environmental hazards and scope of health effects means the scientific credibility of a toxicological assessment will largely be determined by strict adherence to generally-accepted, peer-reviewed investigative methods. 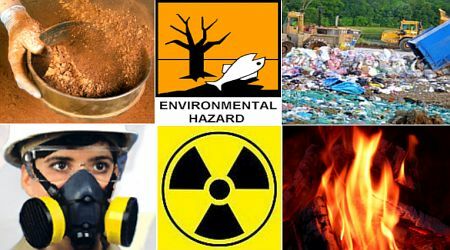 It is not possible to present a comprehensive overview of environmental hazards in this brief section. The substances presented herein are toxic agents for which TCAS has regularly performed dose-response assessments, evaluated potential health impacts and environmental consequences, collected air, water and soil samples, performed laboratory analyses, monitored ambient concentrations, investigated source, fate and transport issues, produced written reports and/or offered expert testimony in litigation. Show all results for "Carbon Monoxide"
Carbon monoxide (CO) is an odorless, colorless toxic gas which is impossible to smell, taste, or see. Carbon monoxide poisoning is fatal at high concentrations. At lower levels, CO can cause headaches, nausea, fatigue, dizziness, disorientation and many other adverse health effects. CO is frequently found in indoor air as a result of incomplete combustion. Common carbon monoxide poisoning emission sources include unvented kerosene and gas space heaters, leaking chimneys and furnaces, stoves, portable generators (as documented in a recent TCAS case study), automobile exhaust and many others1. Carbon monoxide causes the formation of carboxyhemoglobin (HbCO) in the blood which inhibits oxygen intake. Symptoms are heavily influenced by dose, duration of exposure, age, health, environmental factors and other variables. Acute effects can include angina, impaired vision, reduced brain function and neurological effects. Chronic effects can include damage to the heart and respiratory system, disruption of the central nervous system, a variety of pathological conditions and ultimately, death. Carbon monoxide can also adversely affect an unborn fetus.1 TCAS has performed numerous carbon monoxide toxicological exposure assessments and has produced written reports and/or provided expert testimony subsequent to being retained by defendants, plaintiffs, prosecutors, public defenders' offices and U.S. attorney generals' offices. In some instances, TCAS personnel visited exposure sites and re-created the actual conditions under which CO exposures occurred to validate assessment opinions. Please contact our office for additional information. Show all results for "Dust"
The electron microscope photo at left shows a single dust grain magnified by a factor of 100,000. 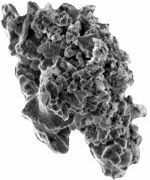 U.S. EPA defines dust as "…solid particles generated by any mechanical processing of materials including crushing, grinding, rapid impact, handling, detonation and decrepitation of organic and inorganic materials such as rock, ore and metal. "2 Thus, airborne substances (whether consisting of or carried by "dust" particles) have measurable toxicological properties which can be assessed in a health context. For example, some dust contaminants are potentially toxic, with prolonged exposure resulting in any of a variety of adverse health effects. Conversely, some dust contaminants may carry comparably lower health risks but can, nevertheless, cause severe nuisance effects (such as aggravation of asthma, eye irritation, bronchial congestion, etc.). Depending on the contaminant, direct contact with skin or mucous membranes can also produce measurable toxicological effects. Particle size, composition, contaminant concentration (as measured in µg/m3) and deposition patterns are all important components in a toxicological dust assessment. Residential dust samples are frequently collected over time at exposure sites to help chart and assess the dose of an alleged toxic release. Airborne distribution and deposition patterns (called "isopleths") can also be useful for documenting the extent of contamination. TCAS has extensive experience in toxicologically assessing dust exposures and remediation issues in residential, environmental and industrial cases in both causative and risk assessment scenarios. Please contact our office for additional information. Show all results for "Mold and Fungi"
Although molds are part of our natural environment, indoor mold growth can cause significant adverse health effects. Molds produce allergens (substances that can cause allergic reactions) as well as potentially toxic substances called mycotoxins. Inhaling or touching mold or mold spores can cause allergic reactions in sensitive individuals. Allergic responses include hay fever-type symptoms such as sneezing, runny nose, red eyes, and skin rash (dermatitis). Molds can also cause asthma attacks and eye irritation as well as skin, nose, throat and lung irritation in both mold-allergic and non-allergic people. More severe reactions may occur among individuals frequently exposed to molds in confined spaces. People with chronic lung illnesses may develop mold infections in their lungs. 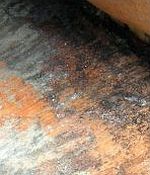 For example, the photo at left showing mold growing on wet plywood under a carpet in a recreational vehicle was sufficiently severe to cause Aspergillus spores to be inhaled and start to grow in the occupant's lungs (as documented in a recent TCAS case study). U.S. EPA3 stresses the importance of moisture reduction to control mold growth; e.g. "There are many types of mold and none of them will grow without water or moisture." A seminal toxicological study4 written in 1966 by Gerald N. Wogan ("Chemical Nature and Biological Effects of the Aflatoxins") documented the presence of mold contaminants with a high order of toxicity in animal feeds. These molds were also shown to possess potent carcinogenic properties in several animal species. TCAS has conducted numerous risk assessments involving mold contamination and provided expert testimony on behalf of both plaintiffs and defendants. Please contact our office for additional information. Show all results for "Pyrolysis"
Pyrolysis is a complex subject touching on many aspects of toxicology. 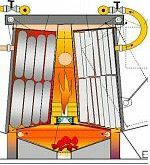 Pyrolysis refers to the thermochemical decomposition of organic material in the absence of oxygen at temperatures typically above 800° F.5 Pyrolysis is widely applied as an industrial manufacturing process to transform medium-weight hydrocarbons from oil into lighter ones (such as gasoline). It is also used to manufacture polyvinyl chloride (PVC) and other materials. Some pyrolysis contaminants are carcinogenic at very low exposure levels and humans and/or animals exposed to pyrolysis waste products can experience a wide range of adverse health effects. TCAS has conducted toxicological risk assessments involving pyrolysis emissions, toxic releases and contamination and disposal of waste materials. TCAS has also investigated source, fate and transport issues, performed dose-response assessments and provided expert testimony on behalf of both plaintiffs and defendants. Please contact our office for additional information. Show all results for "Radioactive Waste"
Radioactive waste is hazardous to most forms of life and is tightly regulated by government agencies to protect human health and the environment. The term "radioactive waste" refers to any waste product containing radioactive material, but there are many types of radioactive waste beyond the high-level radioactive substances typically associated with nuclear power plants. For example, tailings from mining operations in regions rich in uranium can produce both solid and liquid radioactive waste. Such waste can be extremely toxic if allowed to infiltrate into residential areas (as fugitive dust) and/or municipal water supplies. Radioactive wastes which are both radioactive and chemically hazardous are regulated jointly by the U.S. EPA, the Nuclear Regulatory Commission (NRC) and the Department of Energy (DOE). Radioactive materials decay spontaneously to produce ionizing radiation. Any living tissue in the human body can be damaged by such radiation — the most common forms being alpha and beta particles. Higher intensity radiation includes gamma and X-rays. Cancer is the primary health effect from radiation exposure, but other health effects can also occur. 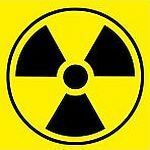 Radiation can cause damage to the body's DNA, the "blueprint" that ensures cells produce perfect copies of themselves. Sometimes the body fails to repair damaged cells (called mutations) or may even create new mutations during repair. Mutations can be teratogenic (affecting only the fetus in the uterus of the exposed individual) or genetic (passed on to future offspring). The primary exposure route for the general population is via ingestion of food and drinking water. Only about 1% of ingested uranium will enter a person's blood.7 Most of this is removed by the kidneys and excreted within a few days. A small amount of the uranium will deposit in the bones. Intakes of uranium exceeding U.S. EPA standards can lead to increased cancer risk, liver damage or both. Other potential targets of toxicity include the reproductive system and the developing organism. Long-term chronic intakes of uranium isotopes in food, water or air can lead to internal irradiation and/or chemical toxicity. The toxicity of uranium is mainly due to chemical damage to the kidneys or respiratory tract, with adverse effect levels varying depending on the particular uranium compound and its solubility.8 Absorption of uranium is low by all exposure routes (inhalation, oral, and dermal). The deposition of inhalable uranium dust particles into the lungs depends on the particle size, whereas absorption depends on its solubility in biological fluids (ICRP 1994a, 1996). A final toxicological profile for uranium was produced in April, 2013, by ATSDR in which minimum risk levels (MRLs) were established for uranium exposure by both oral and respiratory routes.9 TCAS has conducted numerous risk assessments involving radioactive materials and provided expert testimony on behalf of both plaintiffs and defendants. In some cases, we have visited release sites, collected samples for laboratory analyses, produced objective documentation with respect to scope and severity of contamination and provided remediation guidance. Please contact our office for additional information. U.S. Environmental Protection Agency, "Introduction to Indoor Air Quality: Carbon Monoxide (CO)," EPA 404/F-08/008, September, 2008. U.S. Environmental Protection Agency, "What is a fume or dust?," EPA No. 23002-22031, 10/25/2006. U.S. Environmental Protection Agency, "Mold Resources," EPA No. 402-K-02-003, September 2010. Wogan, Gerald N., "Chemical Nature and Biological Effects of the Aflatoxins," Bacteriological Reviews, June, 1966, American Society for Microbiology. Moldoveanu, S., "Pyrolysis of Organic Molecules: Applications to Health and Environmental Issues," Elsevier, Sep, 2009. Soesilo, J. Andy & Wilson, Stephanie, "Site Remediation: Planning and Management," January, 1997, 9781566702072. National Center for Biotechnology Information, "Background and Environmental Exposures to Uranium in the U.S.," National Library of Medicine, 2011. U.S. Environmental Protection Agency, "Uranium," October, 2012. ATSDR, Division of Toxicology and Environmental Medicine, "Toxicological Profile for Uranium," February, 2013. Montage of public domain thumbnail images: OSHA, U.S. EPA, NASA, National Park Service, Missouri Department of Natural Resources, et al. Penn State, CHEM 101: Introductory Chemistry, Carbon Monoxide. Magnified dust particle: NASA, Minor Objects in the Solar System. Pyrolysis of Organic Molecules, "Applications to Health and Environmental Issues"
"Environmantal hazards pose special challenges when conducting a comprehensive toxicological assessment. An appropriate sampling plan and objective analysis regimen are essential if the toxicological merits are to be regarded as scientifically credible."